Governor Strickland promised to sign every pro-gun bill the legislature would send to his office. What he never did promise was to stop supporting Democrats who are anti-gun. Despite that concern, many gun owners, frustrated after years of fighting Republicans like Bob Taft, George Voinovich, Betty Montgomery and Mike DeWine for every inch of ground gained in the name of gun rights, overlooked Strickland's politicking for other (anti-gun) Democrats as politics as usual, rightfully observing that it happens in both parties. So too did the NRA, BFA and OFCC (much to the chagrin of some, who are certainly justified in their indignant "I told you so's" in the wake of his appointment of his former running mate, the "F'-rated Yvette McGee Brown). In 2010, many conservative gun owners held their noses over the politicking for anti-gun politicians and choice of anti-gun running mates and worked with Sportsmen for Strickland. They believed he was better on that single issue than the candidate who would otherwise have earned their support - John Kasich. Maybe he was at that time, but that can no longer be said. Despite a 100% pro-gun record, and despite having nearly ridden that wave of pro-gun support to victory once again, as one of his last official acts as governor, Ted Strickland made an unquestionably anti-gun political appointment. When gun owners needed a friend in the OSC appointment to ensure a qualified justice without a personal agenda, Governor Strickland looked the other way and appointed his former running mate and anti-gun advocate to the bench. Friends and politics have once again won out over principle. Strickland's act, coupled with House Democrat's broken promise to bring two pro-gun bills, SB239 and SB247, to a vote, is bound to have a long and lasting effect on gun rights politics in the Buckeye State. The lesson Ohio's gun owners are taking away from 2010 is that, when it really counts, supposedly pro-gun Democrats cannot be trusted to keep their word. 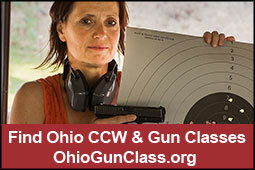 And as certain anti-gun Republicans can attest, Ohio's gun owners have a VERY long memory.